Plot. Income: 4. Initiative: 6. Claim: 1. Reserve: 6. Plot deck limit: 2. When Revealed: Choose an opponent. Discard 1 card at random from that player's hand. If that card is a character, gain 2 power for your faction and place the discarded character in its owner's dead pile. It is possible to wind up with a character that is both in play and in the dead pile. This has no effect on the character currently in play. 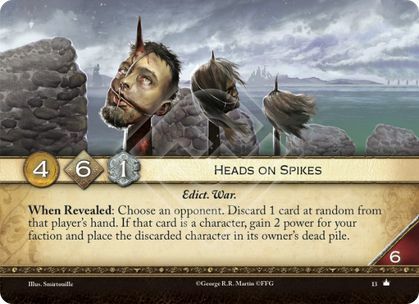 The rules on dead piles/uniques are quite explicit; having a copy in play simply prevents you from playing/putting into play/taking control of further copies. This does have the following practical application: you can no longer place a duplicate on your living copy of the card, as marshalling/putting into play a copy of the card is prevented by the presence of a copy in your dead pile.